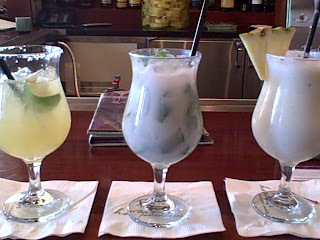 Aloha hour starts at 4:30 p.m. Monday through Friday at Roy's on East Flamingo. With $5.00 drinks and $5.00 appetizers, you can't get a better deal. It's the best way to unwind after a long and exhausting day at the Strip. We sat at the bar surrounded by locals and served by amiable and attentive staff. I ordered the Hawaiian colada, a blend of Montecristo light rum, Malibu coconut rum and fresh coconut purée, with a hint of lime juice and mint. My cousin, who was our designated driver, had a virgin colada and the simple margarita was my sister's choice.